This old Red Cross cabin was the first canteen to be built at a railroad station in the United States. IT was built in the early part of 1918. When trainload after trainload of soldiers came through El Reno, it was here that during their short stop they were fed, given cigarettes, writing paper, and shown much hospitality. Women who served, during the war, at the canteen were: Mesdames L.G. Adams, G.A. Barnard, R.B. Cobbs, Julia Covalt, C.D. Dowell, E. Ewing, J.E. Gallagher, Harry Morris, Lee Rohde, E.R. Woodhouse, Miss. Ethel Dowell, and Miss Lydia Woodhouse. All of them were members of the T.B.A. (Twelve Best Associates) club the T.B.A. was organized when these women were school chums together several years before and when the Canteen was built they were chartered to operate it. Credit for the construction of the canteen goes to a group of Rock Island Carmen, who gave their labor after regular work hours. This group was George Briggs, C.T. Brown, C.R. Watson, Sam Smith, Dan Briggs, George Milner, Jim Milner, Lester Stines, John Stines, W.W. Walker, S.A. Dellinger, A.C. Power, Fred Milbradt, E.W. Burnes, Dave Welch, John Story, C.E. Jones, J.M. Slade, A. Wilhoit, A.C. Clements, A.D. Koener, L.K. Stout, L.J. Lewin, John Stafford, L.R. Moore, John Hunnicut, B.E. Roseberry, E.F. Schnug, H.I. Brown, Dennis Onan, J.R. Rutledge, W.R. Hill, H.T. Farris, and Fate Walker. The hut was built of cedar logs, chinked with mortar and occupied a space of 14X24 ft. Formal services of dedication were held August 1, 1918. Several thousand people came from all sections of Canadian County and thronged the south end of the Railway Platform at this depot. The ceremony was conducted by the El Reno Modern Woodmen & Woodmen of the World. Hon. Scott Ferris was vigorously applauded for the principle patriotic address, followed by a brief address by Father Sevens. Constance Cormer and Malcolm Phelps participated in the flag raising ceremonies. The El Reno Municipal concert band furnished music for the affair. The closing event of the evening of the day’s program was the auction of the various articles of merchandise which had been donated to raise money to secure supplies for the Canteen Department. The auction was conducted by Colonel F.S. Ball and Colonel J.P. Gutelius. Enough money was raised in this manner to start the work of taking care of the needs of the soldiers and sailors. 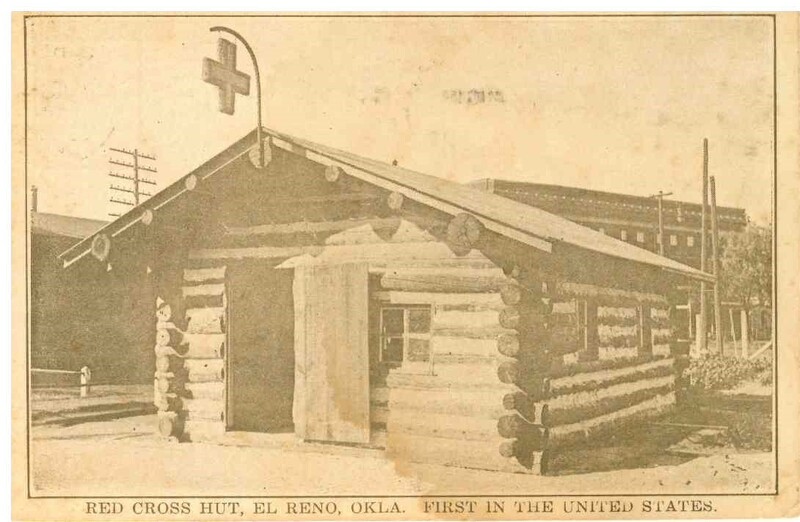 The hut was moved to Legion Park at the end of World War I by the El Reno Lions Club, where it stood as a memorial of the work done during the war. It was also used as the meeting place for various Boy Scout Troops for several years. In 1975, it was moved back to the Rock Island Depot, now used as a county museum, and was restored by museum volunteers. The first Red cross Service Center in WWI – This was the first Red Cross Canteen in the United States. It was erected in 1918, close to where Rock Island Depot now stands. The canteen, which served over 50,000 persons during WWI, became a proto-type for other canteens. 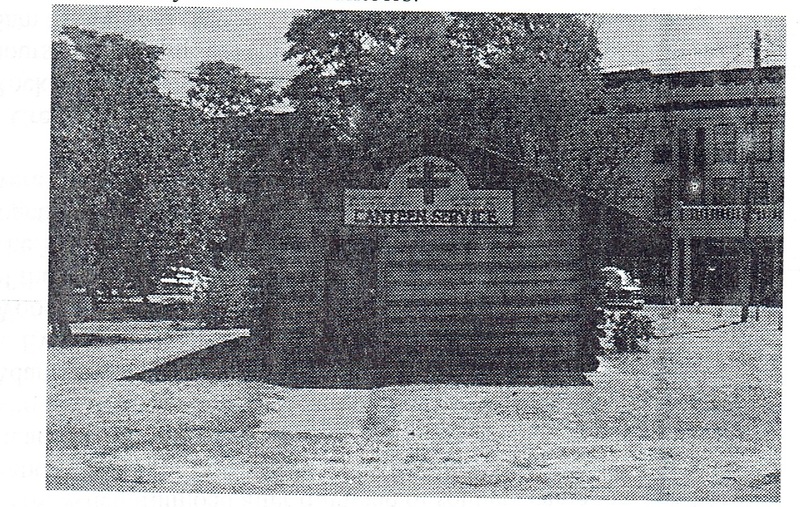 After the war, the canteen was moved to Adams Park and used for the Boy Scout headquarters. In 1974, after many years of neglect, it was moved back to its original location, near the old Rock Island Station. After extensive renovation it now houses relics and memorabilia of World War II. As of June 2017, the Canteen is closed to the public. It has been damaged and is in need of repair.